dog breeds are becoming more and more popular lately. One of my all time favorite is when you get a Labrador retriever and a German Shepherd together and out comes what is called the German Sheprador. 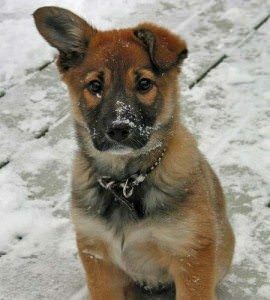 These dogs are also known but other names such as the Labrador Shepherd, German Retriever, and even the Labrashepherd. 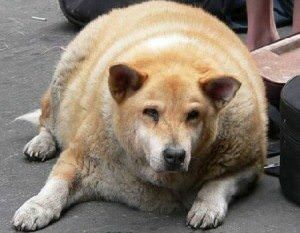 However, this dog is most commonly known as the German Shepherd Lab Mix because it is easier to pronounce and easier to recognize to those that may not be familiar with the mix. should be noted that this is not considered a dog breed but a hybrid dog because you are taking two purebred dogs and breeding them together to get a mix of their traits. So what kind of traits can and should you expect? 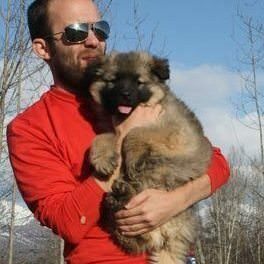 Owning a German Sheprador will likely give you a temperament similar to a Lab and usually all the energy of a German Shepherd which, may I add, is a lot! 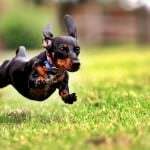 What you end up with is a very smart dog that loves people and has tons of energy to play! 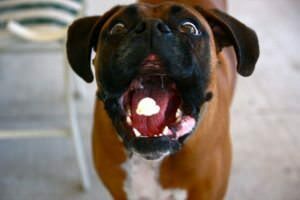 We’re pretty big fans of the Zogoflex for most breeds that are known to have tough jaws and enjoy chewing. One of the keys to training your Sheprador not to chew on your kitchen table legs or running shoes is having a toy to redirect them to. Showing you Sheprador what you do want him to chew on versus what you don’t will work a lot better than simply telling him “no” all of the time. Redirection works really well. 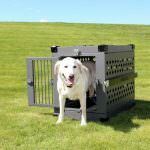 One of the best parts about West Paw’s Zogoflex is that the manufacturer guarantees it against dog damage. The material is BPA and Phthalate-free, which is important to all of us who are concerned about what sort of chemicals are going into the products we let our dogs chew on. It’s almost impossible to find an indestructible dog toy, but this one is definitely on our list of go-to’s when people ask us questions about heavy chewers. It’s kind of difficult to find much negative to say about the Kong. 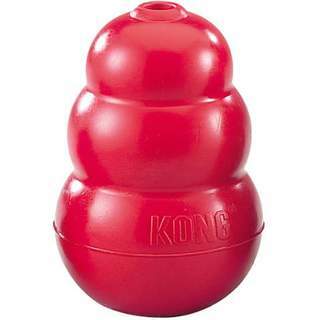 One of our personal favorite things to do with the Kong is mix some peanut butter or yogurt up with some dog kibble and freeze it in the Kong overnight. If you’re gone at work for long days or just want to offer your German Shepherd Lab Mix an opportunity to have a toy that they won’t lose interest in, this is a great method for you. If you go the peanut butter route, you should also make sure your dog has plenty of access to water as peanut butter often makes them thirsty. Since there can be some size variation in the German Shepherd Lab mix depending on the genetics that went into breeding, we also like that the Kong comes in 6 different sizes, so you can get the right size for your pup. Most dogs enjoy carrying toys around in their mouths, so being able to order a toy in the right size for your dog specifically is ideal. Most Shepradors will probably do best with a Medium or Large Kong. The other thing we like about the Kong is the bounce it has. 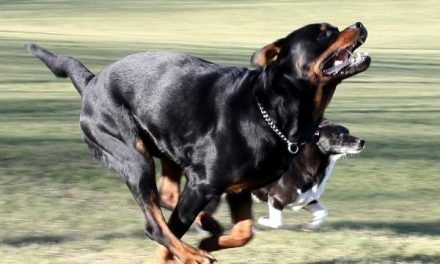 While you’ll want to be more careful with odd bounces causing twerking and jerking on the soft bones of young puppies, you can create even more engagement with your larger breed dog by watching them chase the Kong with its unpredictable bounces. The Kong is a classic. Every dog owner should have one. Get My Dog A Kong! The German Shepherd Lab Mix has dashingly good looks! The appearance of this hybrid dog looks a lot like a Labrador. This means that their coat will be short haired and sleek, with a fit and lean body. They will also typically have ears that flop over the side of the head and a longer tail. The coloring of the German Shepherd Lab Mix is very close to a German Shepherd and is usually a form of tan or black. Others will be completely tan or brown colored with just black around the eyes. 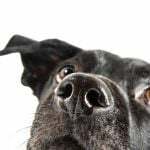 The face will show lots of expression and the black eyes are very cute making them an extremely affectionate dog that will love you back more than you love them. Are you looking for a family dog that is friendly and willing to play all day long? Great, the Sheprador is exactly what you should be looking at. They take traits such as loyalty and the love of all human contact from the Labrador and all the energy and protective behavior from the German Shepherd. This mixes together wonderfully to allow a great dog that is great with family and children to be created. Be warned that they will need many chew toys so nothing around the house gets ruined because like Labs, chewing is a habit. The hair on this hybrid dog is very thick. If brushed regularly, they will shine and look sleek. You should expect the coats to shed about two times a year. If you want to keep the coat in excellent condition, I would suggest getting something called a shedding blade which will help rid your dog of all the dead hair. Sometimes they will have eye discharge which is perfectly normal so just make sure to wipe this away gently. When grooming and clipping their nails, you might have a hard time because they are transparent. Because of this, i would recommend that you leave this task to a veterinarian or a professional in the grooming business. 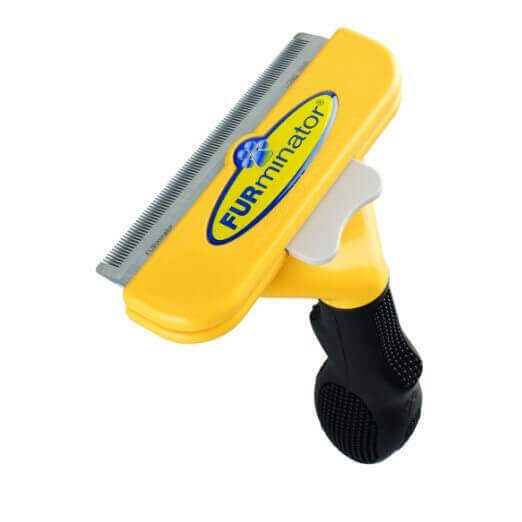 If you do not have access to a groomer or a vet currently, you can always give them some running time on concrete which will keep the nails down. to owner’s of shedding breeds. 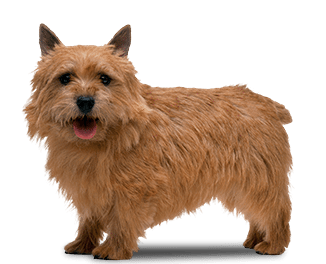 The size of this hybrid will range from a typical medium size dog to a large dog breed dog. You are breeding two larger dogs together which is the reason for this. Generally, females will weight in at about 34-45 pounds while males will weight in at about 10 pounds more at 44-55 pounds. 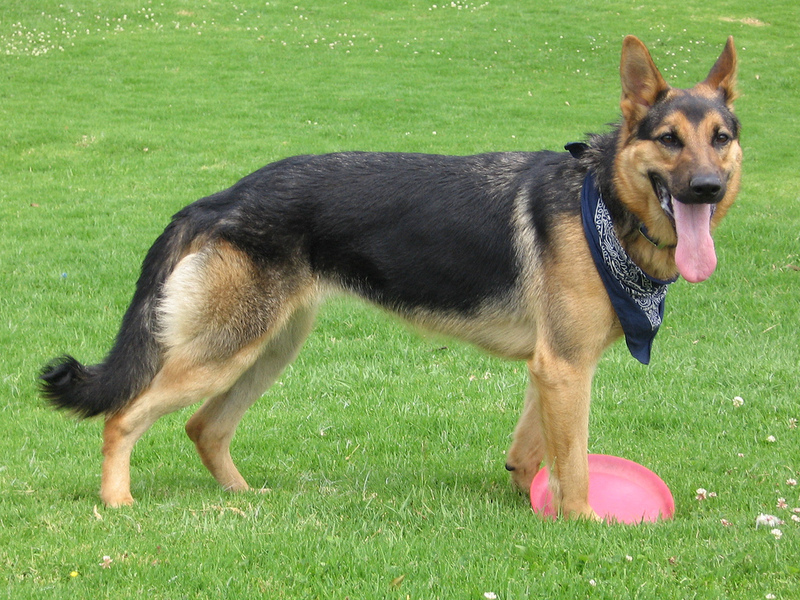 Hip Dysplasia in the Shepherd Labrador Mix is common. If you make sure to give your dog the exercise that they need and not overfeed them, you can make sure that they have as few health issues as possible. You should expect them to live about an average of 12 years and if you are breeding, can give birth to around 5 puppies. If you do not have a large backyard or a place for your dog to run around, you may want to consider not getting this hybrid breed. If the German shepherd lab mix is left alone and they get bored, they can start destroying whatever they please in your home or your yard. They also like to dig so keep them away from the garden and keep them fenced in while they are still young pups. If you have a very active family, this would be a GREAT dog for you! You will need to give the Sheprador adequate exercise or they will get into mischief. They also will be more prone to get arthritis and hip dyspasia if you do not exercise them. Walk this type of dog two times a day or more and give them different toys to play with because they are a very intelligent breed and need to be thinking! Is this Hybrid Dog for Me? The German Shepherd Lab Mix is perfectly suited for a family or individual that has the time to give to the dog. They have lots of energy and need to express that constantly. If not, it can lead to destructive behavior. They are very protective and will guard the house like a champ. If you have kids, they are great companions! NextDo You Have a “Dog Cat”?